Since the Husband and I were in the process of finishing up college when we married, we were definitely on a "student budget"--which translated into a miniscule grocery budget. I found that in order to eat fairly well, I needed to meticulously plan out all our meals. We continued this method of planning meals while living in San Francisco, while in graduate school in Boston, and even today. It has its benefits I tell ya...like saving money...and not experiencing the 4/5 o'clock panic of what to make. It's a win-win situation in my book! 1. Peruse your pantry, refrigerator, and freezer; take an inventory of what you have. What needs to be used up first? What are you feeling like eating this week? 2. Peek through your recipe binder, your cookbooks, your favorite online recipe source (mine include Epicurious and MyRecipe). Which recipes call for the ingredients you already have on hand? For example, if your pantry stocks copious amounts of canned diced tomatoes, consider making a pomodoro sauce over pasta that week. Dress it up with some grilled shrimp and some grated Parmesan-Reggiano perhaps. If a recipe you want to make calls for one tablespoon of fresh cilantro, and you don't want to waste the rest of the bunch, then find another recipe that calls for cilantro. For example, if you make a Southwestern Salad, which only requires a relatively small amount of cilantro, then perhaps make a Thai soup that week, or a curry, or a batch of tacos or fajitas. Are you seeing how this works? Health-friendly grocery stores like Whole Foods (and that fab Co-Op in Cambridge) carry many pastas, grains, legumes, spices, etc. in bulk form. Since spices can be especially expensive, I've been known to purchase a tablespoon of turmeric just to save myself from having to buy the $5 bottle. 3. As you choose meals, write them down on the back of a piece of paper. 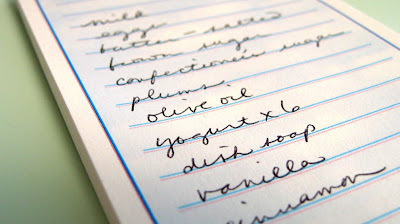 On the other side start your grocery list indicating the items you still need to purchase to make the meal complete. Don't forget side dishes, lunch items, etc. I tape my menu for the week inside a kitchen cupboard where it is easily accessible. When 4 p.m. comes around I check out my list, decide what I'm in the mood for that night and hop to it. I know I have all the ingredients on hand so I don't find myself agonizing about not having one essential ingredient. Since this is the time of day I often refer to as the "witching hour", it's nice to not have to spend an hour trying to figure out what to make before finally resorting to a frozen meal. You'll be amazed at how thirty minutes of planning makes your week (and your mealtime) exponentially easier and more enjoyable. I like the reminder to plan for unused ingredients - I often find myself with extra green onions, or cilantro, as you pointed out. It's perforated between the menu and shopping list and makes it easy to rip off the list and stick it in your purse while your menu plan stays on the fridge. I plan our weekly meals each Sunday afternoon. I look through my vast collection of cookbooks or page through a recent edition of Everyday Food from Martha Stewart. It's an easy way to try new things -- my 10-year-old son now eats Salmon and enjoys a broccoli and bow tie pasta dish. I'm sitting here avoiding making out my grocery list and going... and I read your great suggestions! I go through phases of planning and winging it, but you're absolutely right about making that 4:00-5:00pm time go more smoothly. If I know what I'm making, the stress isn't there!